TREAT COMBO: When you come to the movie, you can purchase any two treat items (popcorn, candy or drink) for just $1.00/person. STROLLERS: We do not have room in the lobby to "park" strollers. Please leave them in your car. CAR SEATS: Because of fire code, car seats cannot be placed in the aisles. If you have a child in a car seat, please purchase a ticket and put the car seat on a theatre seat. SUPERVISION OF CHILDREN: Please do not drop off young children at the movie without a parent or responsible guardian. NEW THIS YEAR! 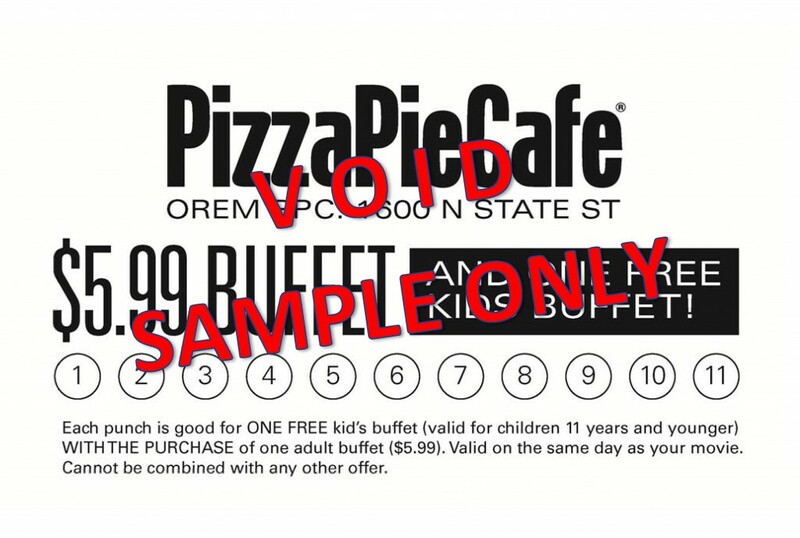 Thanks to our awesome sponsor, Pizza Pie Cafe North Orem, the back of each series ticket has a punch pass offering ONE FREE CHILD’S BUFFET with the purchase of an adult buffet for $5.99. You can use this offer 11 times this summer and have a fun lunch date each week on the day of your movie!